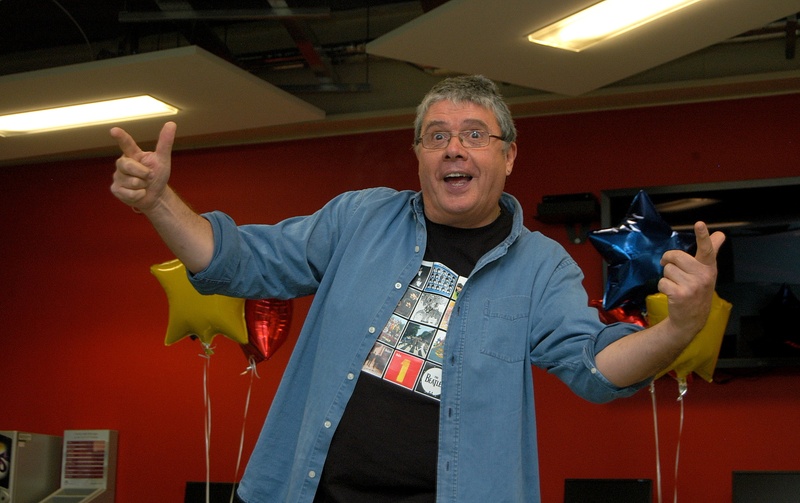 Here’s another picture of the overweight, grey haired bloke who always jumps in-between me and a camera every time my picture is taken. Whoever he is, I wish he’d STOP!!!!!!!!!!!! Aliens in Schools!! (oh yes)!!!!!!!!!!!!!! 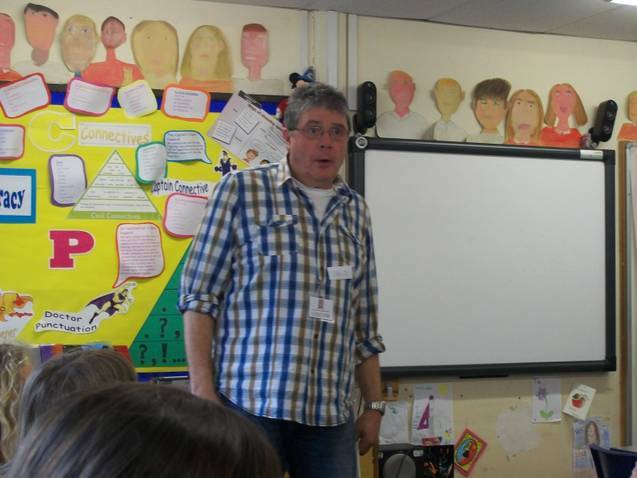 On the 25th of February I visited Carlton Central Junior School in Carlton, Nottingham and spent a LOT of the day talking about weird chickens with nine legs and three wings, aliens, UFOs, space monsters and how teachers could be aliens in disguise. In the OUP book, Monster Poems, edited by John Foster ( a very important poet and editor who was the first person to put my poems in children’s books many years ago) and illustrated by the staggeringly amazing Korky Paul, (see his drawings in Winnie the Witch books as well) there is a poem by me called Watch Your Teacher Carefully, because you never know. I read it out a lot that day. Brilliant school, brilliant kids, brilliant grown ups, one or two aliens. In February I drove over the Pennines and visited Cherry Fold Primary School in Burnley. It’s on Cog Lane and even though I have a Sat Nav I still got lost because I was directed to the wrong school!!! Anyway, they were very polite and told me where the right school was. Cherry Fold Primary has links to Barton Primary, a school I have visited twice before (I got lost the first time I tried to find Barton Primary as well!!!!!) Despite all the confusion, I was made very welcome and I had a really great day working with everyone there and making poems. This is a poem Y5 and Y6 liked. it was for the Outer Space book but didn’t quite make it but it’s about eating fried chicken and finding out that sometimes the bits of chicken you get from the take-away place can’t be real chicken because there are too many legs and wings! It’s Chicken, But Not As We Know It. My eyes began to pop. Three legs and nine wings! To the chicken eating nation. This is me at work in Worksop!!!! The Next Bit Of Catching Up!!!!! Let me tell you about Greenlands Junior School in Sheffield. They had a whole afternoon in January dedicated to a wide selection of many varied events, including hearing my poems.It was called a Mela. I met so many people from the school and its community as the children and their parents (and loads of other grown ups) moved from room to room choosing different activities. Amazing! Later that week I was in St. Augustine’s Junior School in Worksop, performing poems and encouraging the pupils to make their own big poems with me as well as doing some Drama work about Jack and the Beanstalk and writing interesting versions of the story. Really good day!! Later that month I visited Denholme Primary School in Bradford, well halfway up a massive hillside above Bradford actually. The week before there had been so much snow up there that the school had to close briefly, and I can see why. It would take a sled and several packs of very well trained Huskies to get up that hill in snow! It’s a great school and the boys and girls there were really friendly, really lively and full of ideas. I performed my poems to them and then every class made up some great poems with me. The grown ups in this school were really funny and the whole day was just fabbo!!!! Then in February MY NEW BOOK was published. It’s called IT CAME FROM OUTER SPACE! I wrote it with my friend Paul Cookson and Carl Flint did the Amazing And Utterly Brilliant Illustrations!!!!!!!!!!!!!!!!!!!!!! 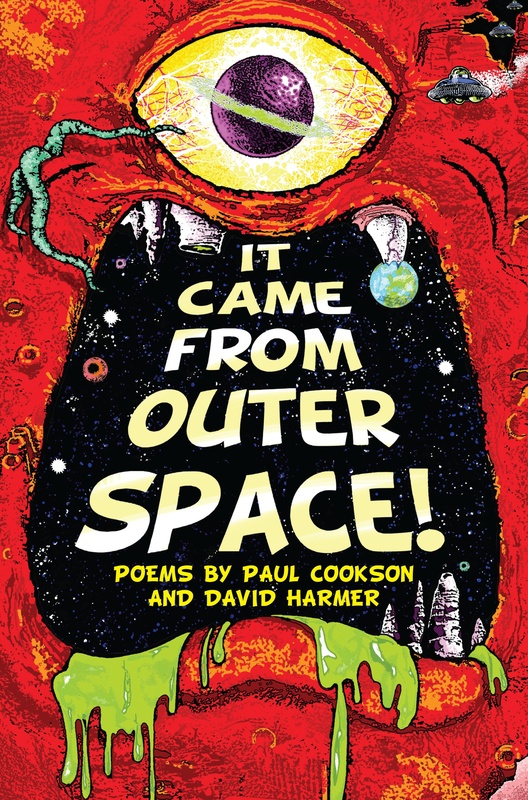 Published by Macmillans Children’s Books, it is crammed with great poems (even though I say so myself) about aliens and monsters and rockets and planets and UFOs and alien attacks and alien take-away food and lots more. Paul and Carl and I love it and think it’s one of the best books we have published. There is actually a facebook site and if you are old enough to visit it you can see more illustrations. 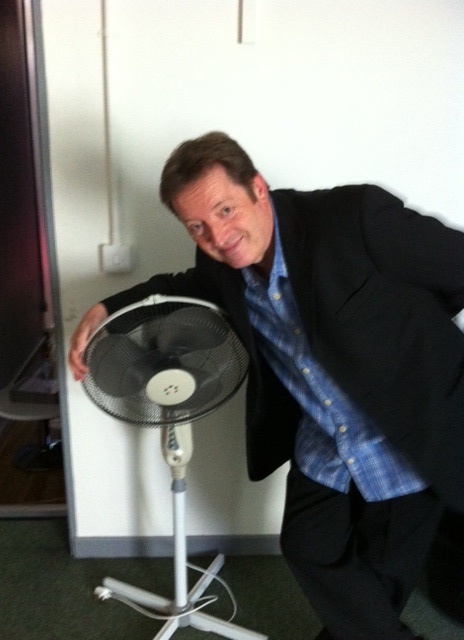 David with his biggest fan! 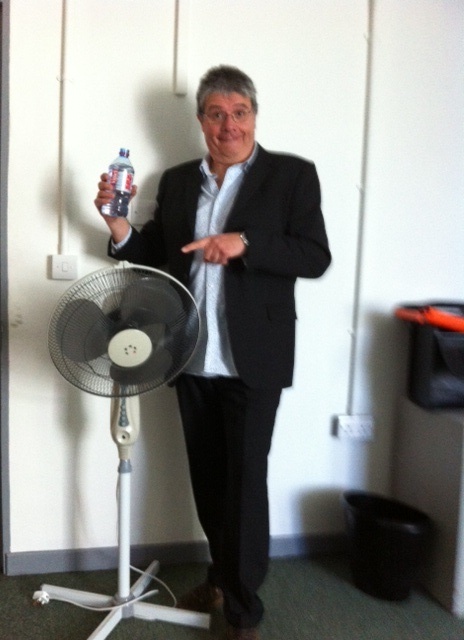 Paul Cookson with his biggest fan! Carl Flint’s incredible cover art for our new book. It really is something isn’t it??? A bit of catching up to do!!!!!! I am really sorry to any of you who have followed my blog and I KNOW I haven’t posted for yonks but now I am …so (deep breath) here we go with what happened since October!! Well, on October 23rd I visited Allerton Primary School in Goole. This was on behalf of the Poetry Society. I have been several times to this great school before and I always enjoy my time there. Once again, I was helping the Y6 children write poems as part of the celebration of the Norwegian Christmas Tree that is sent to London every year from Norway. This year we wrote poems about the friendship that the tree represents between Great Britain and Norway, and some of those poems formed part of the celebrations at Christmas in Trafalgar Square. November 2012 found Spill The Beans performing at Mansfield library, helping to celebrate the great work the library service does and to be part of a fantastic event as loads of children and young people were given awards for a variety of reading challenges they had undertaken. Libraries are just SO IMPORTANT aren’t they? Then I returned to Allingham Primary school, this time to work with all the classes, over a week, in Drama. The children and all the grown-ups in this school were fabulous to work with and we made up some amazing stories using all sorts of Drama ideas, and then the children wrote their stories down. I was also able to read my poems to the classes I worked with and all-in-all it was a most exciting week. What a school!!!!!!!!!!!!!!!!!!!!!!!!! Later in November I was meeting yet more fantastic librarians as part of the Northern Children’s Book Festival and I visited Our Lady of the Rosary Primary School in Peterlee on one day and Thomas Walling Primary School in Plausworth the next. I perfromed loads of poems and everybody joined in and had a really good time. This really is a great job. In December i was back on the Wirral, staying with John and Norma again and spending a day in Whitby Heath Primary School near Ellesmere Port. This was an Able Writer’s day which meant that I met pupils from several schools as well as the host school and we did a lot of work on story writing. We looked at the structure and the grammar of writing stories and during the day all the children wrote an excellent piece of work. Later on in December I was back at Bishop Grosseteste University College in Lincoln working with PGCE students, talking about poetry and performing poems. Which brings us to 2013!!! !